Today Al and I resumed the Wainwright Coast to Coast walk. We left the Greyhound Hotel in Shap a bit after 8.30am in sunshine. With my bad back I had planned a route that was several miles shorter than the Wainwright route. It also had the advantage of a pub roughly halfway! Neither of us had walked in the area we passed through, including the pretty villages of Crosby Ravensworth, Great Asby and Crosby Garret as well the town of Kirkby Stephen. 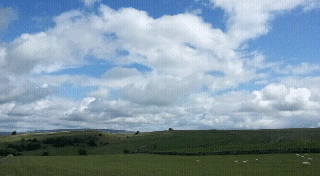 The countryside was typical dales scenery. Lots of dry stone walls and limestone scenery, including several areas of limestone pavement. Except for 5 minutes it was dry, and mostly sunny, all day. See photo. 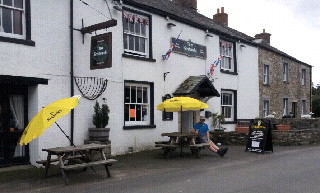 Lunchtime was spent in the 3 Greyhounds in Great Asby. We tried the 2 beers on offer; Cumberland Corby Ale and Theakston Grouse Beater, both well kept and on good form. See photo. This evening in Kirkby Stephen we started in the Bulls Head with Black Sheep Bitter but didn’t fancy the Holt’s bitter so moved across to the Kings Arms for Dent Aviator (not as good as last night in Shap) and Thwaites Wainwright route (not well kept). Now we are off to the Jennings pub down the road to end the night. Tomorrow we walk from Kirkby Stephen to Keld. Good forecast too. Pleased my post is of use. Ground is pretty wet underfoot in places but didn't sink in too far an nowhere difficult to cross. Great update. My brother in law and I set off on the coast to coast this Friday the 10th August. With all this rain we wondered how wet the route is? Can you advise?